Whether you want to build a beautiful development from scratch or convert an existing building Jonathan Reeves Architects can help. Architect Jonathan Reeves uses his skills and expertise to understand exactly what you want and need in your new build project and will enable you to realise your dreams. 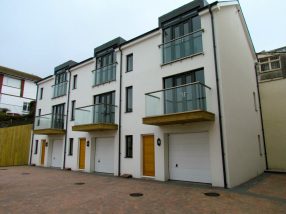 We specialise in providing a high quality, personal service in high quality developments, conversions and new builds. With offices in North Devon and Leicestershire jra work on new build projects throughout the South West and the Midlands. JRA was responsible for the initial feasibility studies, design development and planning submission for this development in Ilfracombe, working in a joint venture with Peregrine Mears Architects. JRA was responsible for the initial feasibility studies, design development and planning submission for this 3 unit residential scheme within a conservation area in Ilfracombe, Devon. JRA also completed the building regulations drawings. JRA was responsible for the initial feasibility studies, design development and planning submission for this 6 unit residential scheme within a conservation area in Somerset. Also on the site were several existing buildings which required conservation area consent to be demolished. Arboricultural reports and Environmental assessments were also commissioned by JRA as part of the planning submission process. 3D models and visuals were developed and used throughout the design process, these were used to generate the elevations and also visuals that have since been used for marketing the site.